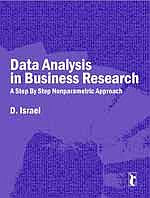 XLRI's Prof D Israel's book on Data Analysis in Business Research: A Step by Step Nonparametric Approach has been published by Response Book, Sage Publications. While most books of data analysis focus, the jacket describes: "on parametric tests, the domain of nonparametric tests is mostly unexplored. brings under one umbrella all the major nonparametric statistical tools that can be used by undergraduate and postgraduate students of all disciplines, especially students of Research Methods in Social Sciences and Management Studies, in their dissertation work.